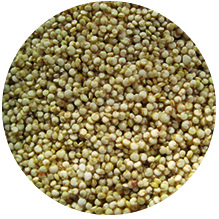 Quinoa is native to the highlands of Bolivia and Peru where it is widely grown since ancient times. It has high protein content and an excellent amino acid balance that makes it a unique grain. A good source of complete protein, containing all essential amino acids. Provides significant amounts of dietary fibre and phosphorous, and is high in vitamins and minerals including magnesium, iron, and calcium. It’s flour can be added to cookies or muffin recipes. Flakes are ready to eat (yogurt, salad). It is great to use in tabouli, serving as a delicious (and wheat-free) substitute for the bulgur wheat with which this Middle Eastern dish is usually made. Quinoa pasta is higher in protein than wheat pasta.